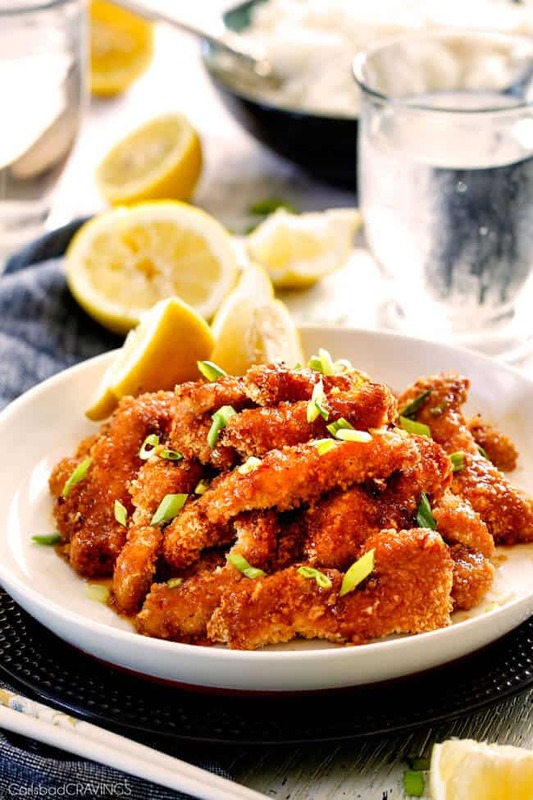 Crispy Chinese Lemon Chicken drizzled with a sweet and tangy multidimensional lemon sauce that is irresistibly delicious! Your entire family will love this chicken and you will love the one step batter – so much easier than traditional breading! Aloha! I am still in Kauai (follow my Instagram Stories HERE) and enjoying some pretty crazy delicious food. But to be honest, this Chinese Lemon Chicken that I made just before I left is right up there. Yes, its that good. 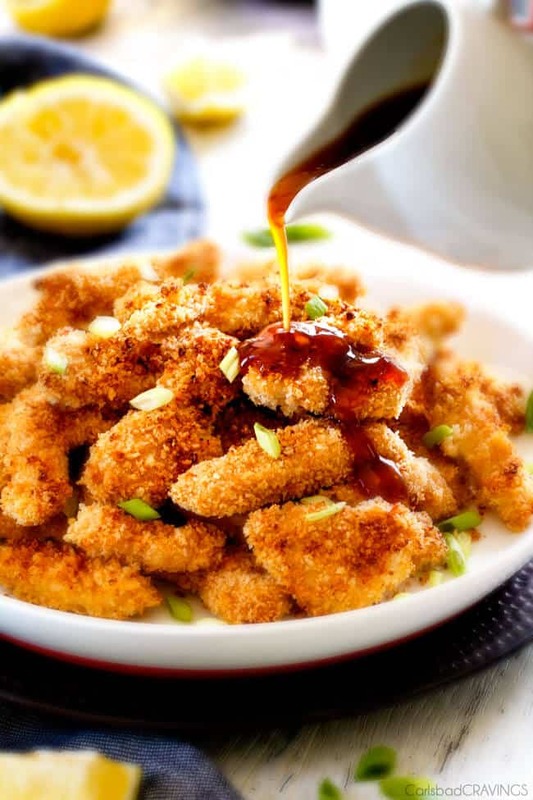 The chicken is tender and juicy, infused with flavor through and through, the golden breading is crispy and crunchy and the Chinese Lemon Sauce is the perfect balance between tangy and sweet. 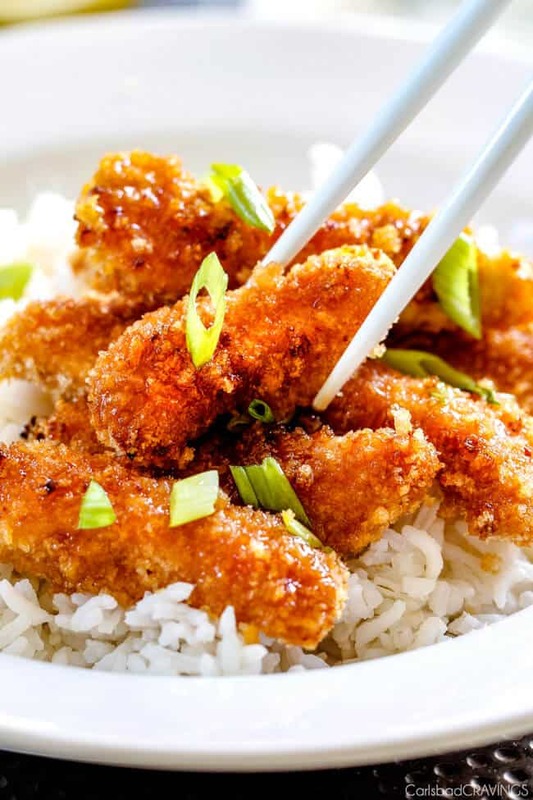 In other words, this Crispy Chinese Lemon Chicken is about to become a new family favorite! To make this chicken even more happy to make, I’ve created a one-stop batter instead of the multi-step process of marinating the chicken, dredging in flour, egg, flour, etc. I have always wanted to try this method and I am kicking myself for not perfecting it sooner! It makes breading chicken super quick and SO easy, not to mention way less of a messy production. Simply combine your marinade of lemon juice, honey, soy sauce along with your egg, egg yolk, flour and spices all in one bowl to create a nice sticky batter. Add your chicken and let sit for 20-60 minutes to soak in flavor and tenderize. Now all you have to do is coat your chicken in breadcrumbs! 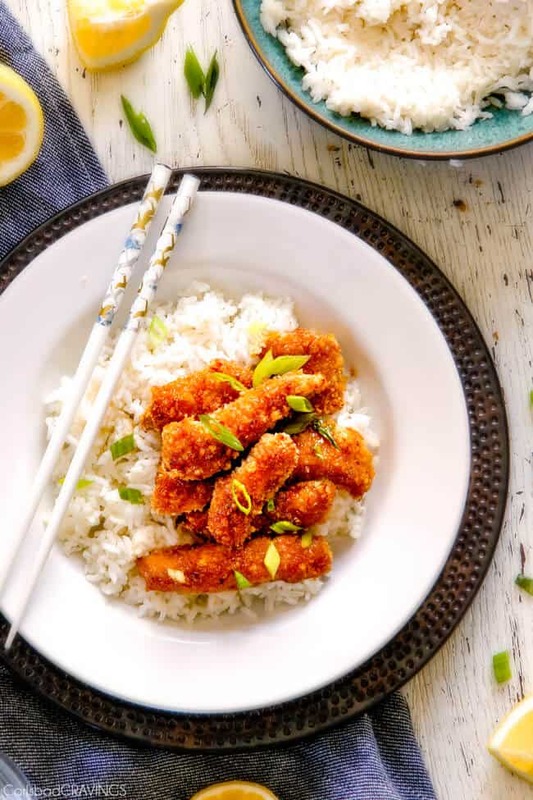 I chose panko breadcrumbs to ramp up the crispy factor of this Crispy Chinese Lemon Chicken instead of just flour. 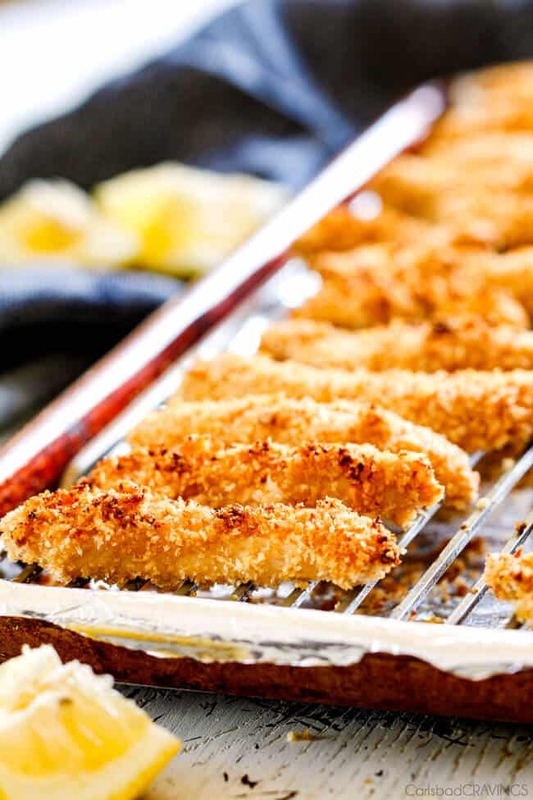 Panko crumbs are also larger than normal crumbs so they become even crispier than traditional breadcrumbs for a guaranteed crunch in every breaded chicken strip bite. To make breading chicken even more streamlined and less messy, use one hand to add the battered chicken to the panko and the other hand to coat in the panko then your hands can stay clean instead of caked and crumbly. simple pleasures. 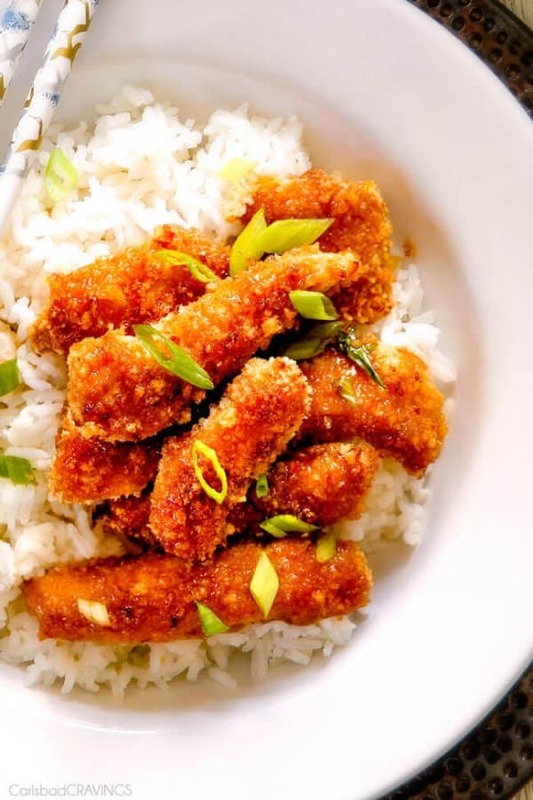 I first tried to bake these chicken strips after breading with already toasted panko and while the chicken strips were somewhat crispy, they were not crispy enough to even call “crispy” in the title. This texture is totally fine and you are welcome to bake them, but what really made me pause was as soon as the sauce was drizzled over the chicken, the breading not only wasn’t crispy anymore, it become undesirably soggy. No thank you. You could avoid this by dipping the chicken in the sauce instead of drizzling it, and you are welcome to do so, but in my book the pan fried version takes the cake without any competition. So if you want extra crispy, extra fabulous Chinese Lemon Chicken, pan fry the strips in a pan of shallow oil in two sets, being careful not to crowd the pan and out will come beautifully golden chicken with a nice crunchy texture on the outside and tender chicken on the inside. Patrick could not stop eating these strips plain! And he definitely could’t stop once I drizzled the breaded chicken strips with the Lemon Sauce. The sauce is a symphony of ingredients including lemon juice, apricot preserves, honey, soy sauce, red wine vinegar, Asian Sweet Chili Sauce and freshly grated ginger. The Lemon Sauce ingredients simmer together to create a sweet and tart sauce so layered with flavors you won’t be able to stop stuffing your face. Dinner as it should be. 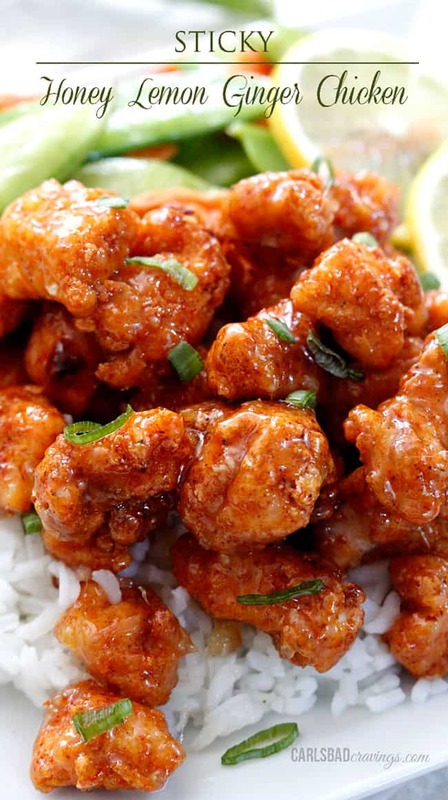 Want to try this Chinese Lemon Chicken? Slice chicken in half through the equator to create thin fillets then slice chicken into thin strips across the grain. Cut strips into 2-3 inch pieces. Whisk together all of the batter ingredients in a large bowl. Add chicken, stir until evenly coated. Let sit at room temperature 20-60 minutes. Meanwhile, whisk together all of the Lemon Sauce Ingredients in a small saucepan. Set aside. Add all of the panko to a shallow dish or bowl. Working with a few pieces of chicken at a time, use one hand to remove chicken from batter and let any excess drip off. Add to panko. With your other hand, toss chicken in panko until evenly coated, pressing panko firmly into chicken. Add more breadcrumbs if needed. Remove to a plate or baking sheet. Repeat until all chicken is coated. Add enough vegetable oil to a large nonstick pan to cover 1/4-1/2 inch up the sides. Heat over medium high heat. Working in 2-3 batches (don’t crowd pan so chicken can get crispy), add chicken to pan and pan fry until golden and cooked through, about 3-5 minutes per side. Remove to paper towel lined plates/baking sheet. Repeat. Meanwhile, whisk Lemon Sauce to recombine and bring to a boil, then reduce to a simmer until thickened. Taste and add additional lemon for tangier, brown sugar for sweeter, sriracha for spicier if desired. Drizzled cooked chicken with Lemon Sauce and serve immediately. First off. . .can I tell you how jealous I am that you are in Kauai. The hubs and I have been talking about going there. . .but he has suddenly developed an obsession with Oman and want so leave first week in October. What can I say. . .the man is crazy. Love the recipes! Don’t like all the adds that are dispersed between the beautiful pictures. Are they really necessary? They are everywhere. It appeared that no one has a choice. Hi Ed, if you’ve visited other blogs, that is where most bloggers are choosing to place their ads these days. Most of us work more than full time on our blogs so we have to do the necessary evil and have ads somewhere. I know its not ideal. Thanks for your understanding! Wow! Another amazing recipe! 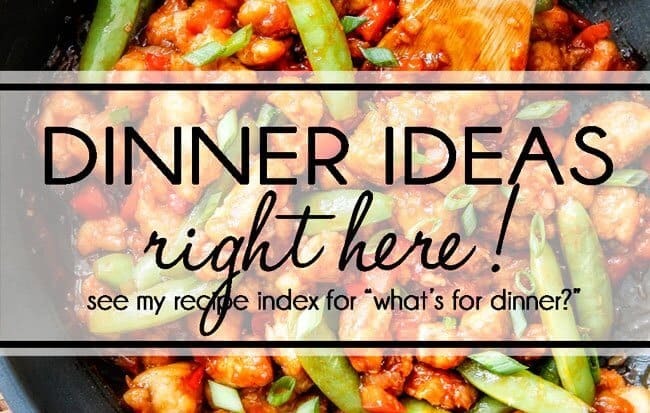 I made this for dinner tonight, and it was awesome! I love the one-stop batter…it was such an easy way to bread the chicken. 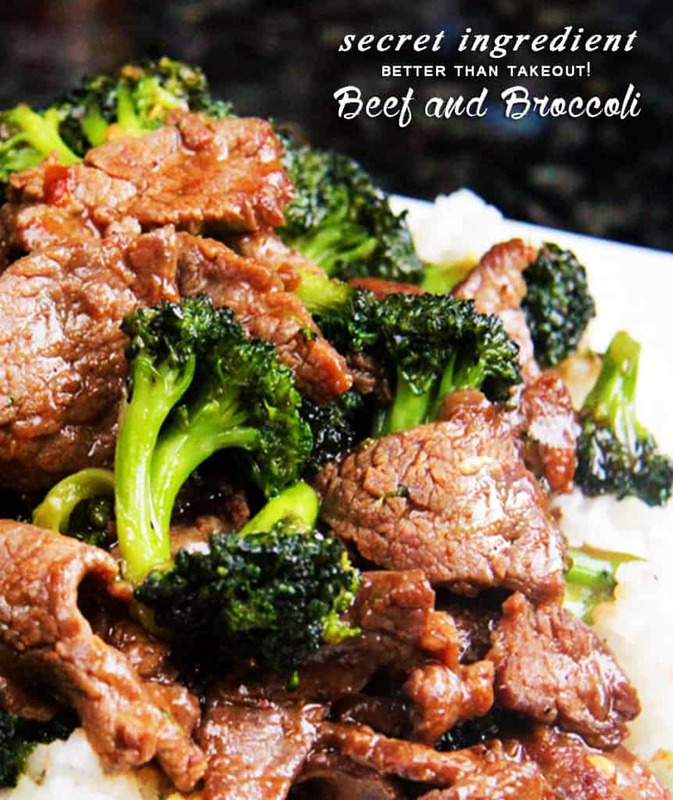 Flavorful and easy….can’t beat it. The panko breadcrumbs came out perfectly crispy. The sauce was delicious. My family said we never have to go out for Chinese food again. 🙂 Thank you for the great recipe. You are so welcome Kara! I love hearing what a hit it was from the batter to the panko to the sauce! And thanks for the ultimate compliment that it was so good you never have to go out for Chinese again – wahoo! but you might want the break 🙂 Thanks and have a delicious week! yep, fried produced a perfectly crispy chicken that could withstand the sauce. I also loved the unique batter it marinated in. Yum! Sometimes baked will do but fried is always better, especially with this chicken! Thanks Layne! I like your drive to simplify the breading process and prevent caked-finger syndrom, lol. One tip for a hybrid approach to frying OR baking is to do both. I (quickly) fry first, while not cooking the chicken or other meat throughout, then letting them finish in the oven for another 10 minutes or so. This gets you a couple things. a) time to do other things, b) typically softer meat since a slower cook in the oven gives the meat a little more time to tenderize. It also makes all the meat equally hot if your pan doesn’t hold all the meat and you end up frying in batches. caked finger syndrom – LOL – its real! Thanks so much for the frying/baking tip – I will definitely give it a try next time, thank you! Crunchy and an amazing sauce! Thank you! You are so welcome! Thanks for taking the time to comment!